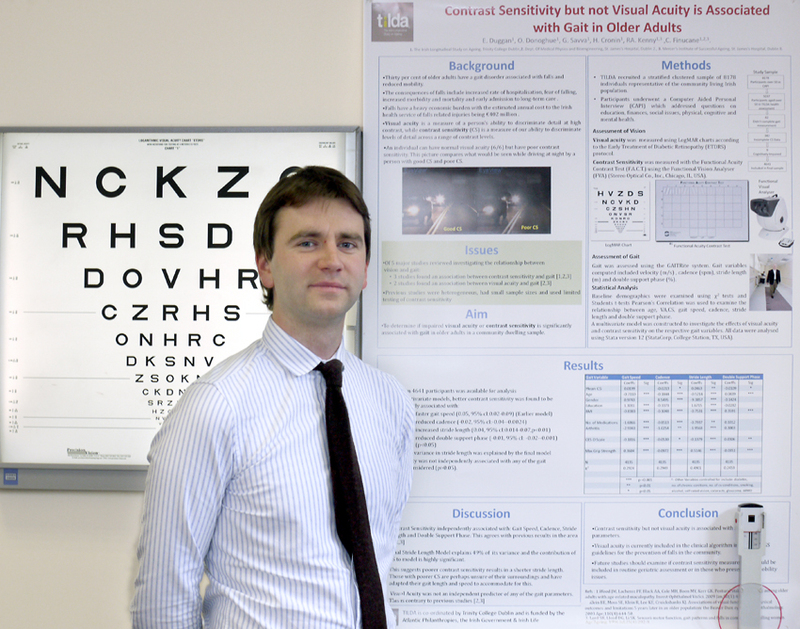 Mr. Eoin Duggan, a medical student based at TILDA, recently won the prestigious Fergus Anderson Prize at the Spring British Geriatrics Society conference in Belfast. His research investigated the relationship between vision and gait in older adults as part of a wider program of TILDA research examining the biopsychosocial risk factors associated with falls in the elderly.. This work was funded by a recent HRB Summer Student Scholarship and conducted under the supervision of TILDA researchers Dr. Ciarán Finucane (Medical Physics and Bioengineering), Dr. Hilary Cronin (Geriatric Medicine), Dr. Orna Donoghue (Biomechanics) and TILDA Principal Investigator, Professor Rose Anne Kenny. The research was conducted using data from the first wave of TILDA and the findings indicate that poor contrast sensitivity but not visual acuity is related to poor gait performance in older adults. These findings are significant clinically and may contribute to a new awareness about the importance of vision, particularly contrast sensitivity, in the field of geriatric medicine. This is particularly relevant in conditions like falls, which are related to gait disturbances. International falls risk guidelines already include an assessment of vision as part of a comprehensive clinical assessment. These findings suggest that contrast sensitivity is a more important marker than visual acuity, which is normally used in clinical assessments of older adults. Ongoing research in TILDA aims to determine the importance of this and other parameters as part of a global falls risk assessment program, with a view to reducing the prevalence of falls, which occur annually in one in three adults aged over 65. Commenting on the results, Professor Rose Anne Kenny said: “This research highlights the importance of comprehensive assessments when assessing complex health issues common in older adults, such as falls. Poor contrast sensitivity potentially puts the ageing population at risk of serious falls as it limits their gait patterns. Comprehensive testing and treatment strategies targeting vision may in the future help us better enable the independence of older adults”.